Air Marshall Sir Arthur Coningham, K.C.B., D.S.O., M.C., D.F.C., A.F.C. 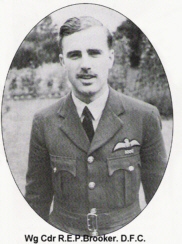 Gp Capt J. R. Adams, A. F. C.
D. S. 0., D. F. C.
No I Sqd. Sqd, Ldr Hall, D. F. C.
No 3 Sqd. 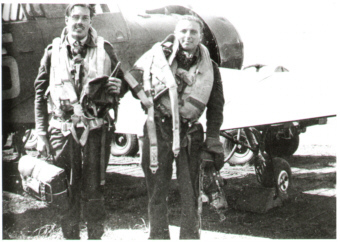 Sqd Ldr Laurie, D.F.C. Wg Cdr R.E.P. Brooker, D.F.C. No 5 Sqd. Sqd. Ldr Pennington -Leigh, D.F.C. 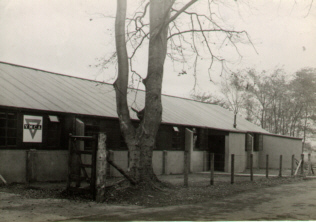 The Fighter Leaders School had been in existence at Aston Down, Gloucestershire, Charmy Down near Bath and Chedworth, Gloucestershire for just one year but because of the concentration of air activity in the south west, its high incidence of wet Weather and the three moves of the unit, it had not enjoyed too much success. But that was intended to change and quickly. The plans for the invasion of Europe had been established and the ideal dates set. Milfield as the Typhoon 0T.U. had already played its part and produced the number of Ground Attack Pilots required by the fifteen new Typhoon squadrons, that the invasion and advancement from the bridgehead, would require and was now to train the squadron leaders, men who were experienced in the fighting aspects, to operate the squadrons from primitive airstrips in close support of the ground troops and in the planned rapid movement through France, sometimes from airfields the Germans may have recently left, with just enough time to lay mines and booby traps. Assembled at Milfield were the aircraft, weapons, instructors and scientists. These scientists would analyze the results of different weapons, used on a variety of targets from an assortment of different approaches and with many different weights of bomb and variously timed fuse settings flown by the pilots on course. The final results would be passed on as a bulletin to 2nd T.A.F. 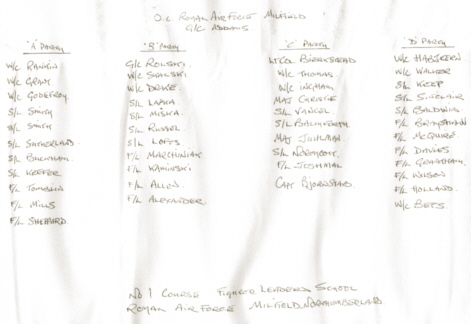 squadrons and later when the Americans joined the last courses - Nos. 3,4 & 5 - the U.S.A.A.C. in England advised the Headquarters in America that an establishment similar to the F.L.S. Milfield be set up in the states. This later became the College of Air Tactics, Orlando. The Air Support Course (A.S.C.) embodied all the teachings of the established Fighter Leader School with the added advantages of a high weather factor as exists at Milfield, a unit of station status, an air-to-air firing range and most importantly an air-to-ground range for live ammunition and rocket firing and practice bombing targets. All of these had been available at Milfield for some time or were just a short flying time away, all in an area of the country with few other intrusions. One of the staff members, S/Ldr. M.J.K. Donnet, D.F.C. had trained in the Belgian Air Force pre-war, and had taken until July 1941 to get to England and join up with his countrymen. He and Leon Divoy, an officer he had known at Evere in officer training, had located a private aircraft in a hangar on an estate occupied by the Germans and had worked on the aircraft to make it basically airworthy, transported motor fuel by bicycle, took off, flew the North Sea and landed in Essex, not quite as easily as that, best read the book "Flight to Freedom",	The now, General Aviator Baron Donnet leaves out much of his war and much	of his time on the staff of the F.L.S. Milfield. but kindly gave answers to my	questions of the F. L. S.
The object of the courses at the Fighter Leaders School, (F.L.S.) was that all pilots were to be responsible, in turn, for the simulated operation he was to practice, to brief, to lead and to de-brief after. The Fighter Leader School Tactics instructors followed within the formation or shadowed the formation from a distance and some observed the exercise from the range position or with the Army front line liaison position. 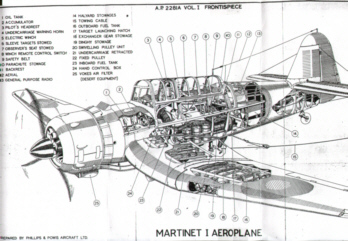 The Air Liaison Officer performed the same duties as had already proved so effective in the North African campaign, that is, where a car or light armoured vehicle, carried an Army Officer and an experienced pilot, who, when advised by the troops of the requirement for an attack upon enemy positions forward of the allied front line, (bomb line), would call a section holding an airborn position, at a particular map referance, to deliver a particular form of attack, cannon, rocket or bomb on an area indicated by coloured smoke, coloured panels or an indicating flare pattern. These four aircraft - a "Cab Rank"- would usually be on station within the map referance for a period of twenty minutes and if not called upon for support of the Army within that period would fly on to attack forward targets, so disrupting supplies to the enemy forward line. This harassment, to a distance of 100 kilometres behind the enemy front lines. 08.00. Day One. A & B parties flying at Milfield. C & D parties to Brunton for A.A. demonstration. Booby traps, mines etc. Arrangements for A & B parties, morning flying A party with Armament Wing. B party with Tactics Wing. After Lunch to Brunton for A.A. demonstration, etc. As C & D`s morning programme. 2nd Day - Assembly West end of No 2 hangar, A.A. demonstration then to visit A.A. gun positions. A, B & C parties flying with Tactic Wing, exercise Rover Tentacle, a re-arming and refueling exercise at Brunton. D party flying with Armament Wing. Naval lecture - Commander Sinclair-Forbes. D.S.O." Naval aspects of the landing operation". 3rd Day. - Air Officer Commanding - Air Marshal Sir Arthur Coningham visiting the Unit. Officers in training for the invasion of Europe. Air Vice Marshal Stevenson A.O.C. 9 Group and Group Captain Atcherley also visit. Station Commander G/C Adams conducts Prince Bernhard and party to Goswick range for a demonstration by all squadrons. Captain M Bouquen killed as Spitfire blows up in the dive to bomb the beach head targets. Major H.J.Fraser. Army Liaison Officer. 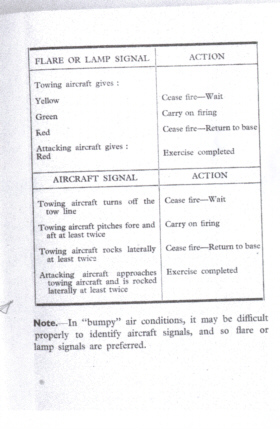 Co-ordinated Army participation and conducted lectures in the battlefield requirements of Air Support. Weeks 2 & 3followed the same pattern, working up to Wing strength. Wg Cdr Geoffrey Page. D.S.O.,D.F.C and bar, permitted me to quote from his book. "Tale of a Guinea Pig", an incident, that occurred to him during Air Support Course No2. "While at Milfield I had one experience that was not without its thrills. One crisp, cold morning we were ordered to carry out a routine dive bombing exercise. This particular day I was flying as number two to another pilot. This meant he was my leader for the sortie and I was to follow at all times. We turned into wind at the end of the runway which stretched ahead of us with three foot snow- banks on either side. The ice on the runway itself gleamed in the early morning light. My leader raised his hand and commenced the take- off. Tucking my left wing close behind his right one I opened my throttle firmly to keep station. Our tails came up as we roared down the runwy. Then I realized that a cross-wind was causing the other aircraft to veer in my direction as its wheels slipped on the icy surface. Naturally I had to ease over to the right as well to avoid collision. I could see the snowbank under my right wing. Just as we got airborne I was almost into the bank and the thought of hitting it with a five-hundred pound bomb under my aircraft was not an encouraging thought. Swiftly I moved the" wheels- up" lever, but too late. There was a thud beneath me and the aircraft gave a slight lurch. Knowing I was in trouble I turned away from my leader but continued to climb. I then tried to figure out the situation. Firstly the two green lights on the instrument panel were not shining. As I thought, probably the right wheel had struck the snow-bank and either the wheel and the oleo leg had snapped off, or were hanging down in some distorted fashion. My eyes swiftly took in the engine instrument readings and were immediately arrested by the glycol coolant temperature. It was rising alarmingly, and soon the engine would stop through overheating. A dead engine meant a wheels-up landing in a field with a deadly bomb attached to soften the impact! A quick look at the altimeter showed me I was too low to bail out. Even if I could, perhaps the abandoned Spitfire and its lethal load might dive into one of the farms or houses scattered below. I had no choice but to turn my crippled aircraft seawards and there jettison the bomb, provided the engine did not pack up beforehand. I throttled back to try and keep the temperature under control, but this meant eliminating the possibility of gaining more height. Painfully, slowly the coastline came towards me and the temperature needle reached the danger mark. Thankfully, I limped over the beach and immediately afterwards pressed the bomb release button. Lightened of the load, the engine bore less weight and with a singing heart I returned to the airfield, there to execute a belly landing on the snow-covered grass. My first introduction to skiing". I recommend you read the book. Wg Cdr Geoffrey Page. D.S.O., D.F.C. and bar. A nephew of Sir Fredrick Handley-Page. The founder of the aircraft manufacturing company Handley Page. Died in the late 1990`s. The pattern of this Cab Rank system is still employed today and the attack would be delivered down to ground level, not as was used in the Gulf War, 16,000 feet and killing the wrong troops. The practice range was the already established range at Goswick used by 59 O.T.U. earlier but with a rail embankment section. Plenty of armoured targets and moving targets added to those previously installed over the years. 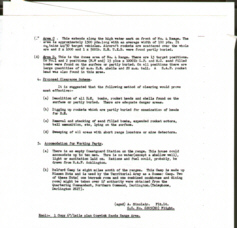 The courses were run to a thirteen point plan, so maintaining a solid continuity, course by course and ensuring the findings of each course were quickly passed on to squadrons in bulletin form, that staff instructor tours did not exceed three months and that students passing from the course only went to operational commands. Each course culminated in an open discussion, constructive points of view being recorded before officers returned to their own units. No. I course included British, Canadians, Polish and Norwegians. No. 2 course, British, Canadians, Polish, Czechs, French and Americans. Nos. 3,4 & 5 courses were mainly two Americans to one other nationality. Still 60 on course. 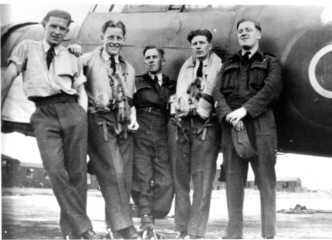 Command of the Culmhead Wing, a six squadron wing, he finished his war with a total of 16 enemy aircraft destroyed. 1 unconfirmed, 1 probable, 3 damaged. in the 1960`s he was a Group Captain in command of an Early Warning Radar Station and retired as an Air Commadore. 6 April 1944. No 3 Air Support Course. Royal Air Force Milfield. W/C P.M.Brothers. 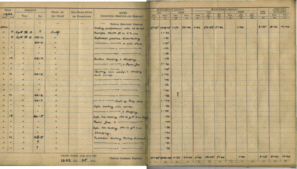 D.F.C and bar, attended this course and the copies from his flying logbook endorse the booklets pages 16 to 20 which indicate an average programme. 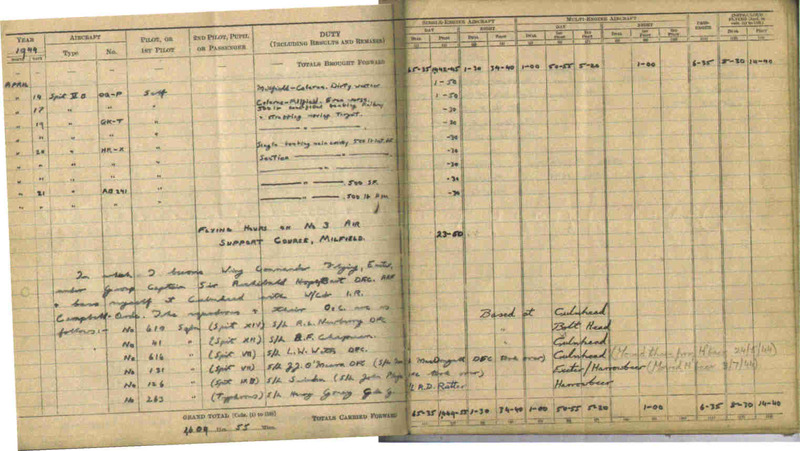 Also shown in the flying logbook copies is his first flight in a Mark 9 Spitfire, although this mark of Spitfire had been in service for about a year and a half, fitted with the Rolls Royce Merlin 61 engine, this engine had a two stage supercharger, giving a boosted engine performance at sea level and the second stage of the ` blower`. supercharger came in at 15,000 feet. He said , "When it cut in, it was like a continued hefty push in the back !" and as you can see 20,000 feet in two and a half minutes, which he thought was `terrific` when compared to his normal Spitfire Mk 5c. Air Commadore P.M.Brothers. C.B.E., D.S.O., D.F.C. and bar. Now lives in retirement in The Vale of the White Horse. As an example of the course form. My thanks to Lt Col William R Dunn, U.S.A.F.retd. who replied to my questions. Bill Dunn the first American Ace of the Second World War (five enemy aircraft confirmed shot down). And it took thirty years for him to receive his Distinguished Flying Cross, as two other American officers had been credited with achieving five enemy aircraft before him. Once again why not read the book "Fighter Pilot", William R. Dunn, University Press of Kentucky. "We brought our own aircraft to the school and flew it during the course, (Air Support Course No 4). I might add here, for your information, that on the last day of the course, the Group Captain let everyone change aircraft. It was an utter mad house in the air - P47 pilots checking out on Typhoons, Spit guys off in P51`s, P38 drivers trying to fly Spits - then everyone switching again to another aircraft. It's a bloody wonder that no one was killed or pranged. You`ve never seen a traffic pattern (circuit) like that one. Well we all survived somehow, I got to fly a Spitfire Mk 9, Typhoon and a P51. Only one guy, a Dutchman flying somebody`s P51 scraped off a wing tank on a tree during a low buzz job. The tank had been modified by the American pilot and his crew chief, to carry their clothing and a tool kit. So, after the too low pass, clothes adorned the tree branches and tools were scattered all over that part of Scotland. After we had completed the course we were rated as "Combat Leaders" for our particular combat group. As a mark of distinction, we wore a blue felt patch, with a gold border, backing our flying wings. 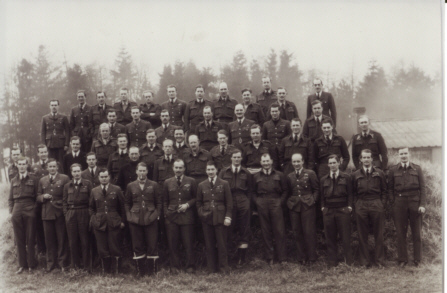 Part of the Air Support Course involved Major Fraser`s private army, Maj Fraser was the officer in charge of a small army contingent based at Royal Air Force Milfield. Some of whom often camped out at the hamlet of East Horton, and would use a dedicated area to the North, on Horton Moor to stage a coloumn of tanks or a vehicle convoy, in movement about the countryside, these staged convoys, would have aircraft vectored onto them for simulated attacks of troop depositions, one of the ex tank drivers wrote to me in 1995 to give me his version of his Milfield past, late in 1943. Mr. Martin had been approached, while in the N.A.A.F.I. at a camp on Salisbury Plain, by an officer, asking if there were any drivers who had driven Matilda tanks and would like a "special" job, thinking this might be a posting to sunshine,sea and sand, he and a mate volunteered, only to find themselves a few days later in the wilds of Northumberland. During the course of their time there and after a day being attacked by various formations of aircraft and the consequent low level beat up, he had been approached by a sergeant pilot who advised him that to stand on the top of the turret of his Matilda might not be such a good idea, as a pilot only has to make a small mistake and he would be minus one head. A look at this copied map, of the period, shows the proximity of the inland bombing range to the airfield and to the troop concentration, practice, ground attack area at Horton Moor, the variety of aircraft out of Milfield and Brunton, using these targets, the air to air North and South ranges and Goswick air to ground range must have put an awesome number of high performance aircraft in those few square miles. Some craters from these practice bombs, dropped on Doddington North Moor dive bombing practice range, were still visible in 1994. 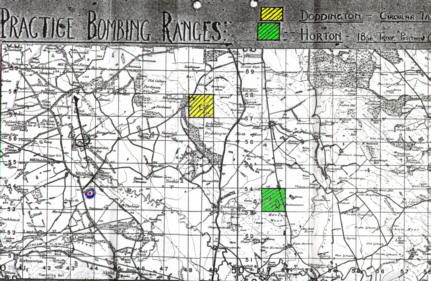 The practice bombing range at Doddington North Moor, just three and a half miles from the center of Milfield airfield and about a mile and a half from the nearest part of the Milfield circuit, was approached, in the dive from 6,000 feet, down to less than 1,000 feet and the 15 lb practice bomb/bombs dropped, then a climb away to reform into battle formation, all visual, the various, other forms of local air movements i.e. circuit flying, local navigational flying, traffic to and from the various ranges, in coming traffic to Milfield and the transient traffic up and down the county, the other local airfield traffic going about similar business and sometimes overlapping Milfield`s area, all at around 6,000 feet. All visual and not under positive air control. A really busy piece of sky in 1944. People who have read the booklet most often say " I can`t believe that so many men lost their lives in training at Milfield", I am quick to point out that there were 45 O.T.U`s of the various commands, all losing about fifty to fifty five aircrew during the Second World War, some 2,500 aircrew at the O.T.U`s lost their lives before actually going to war. 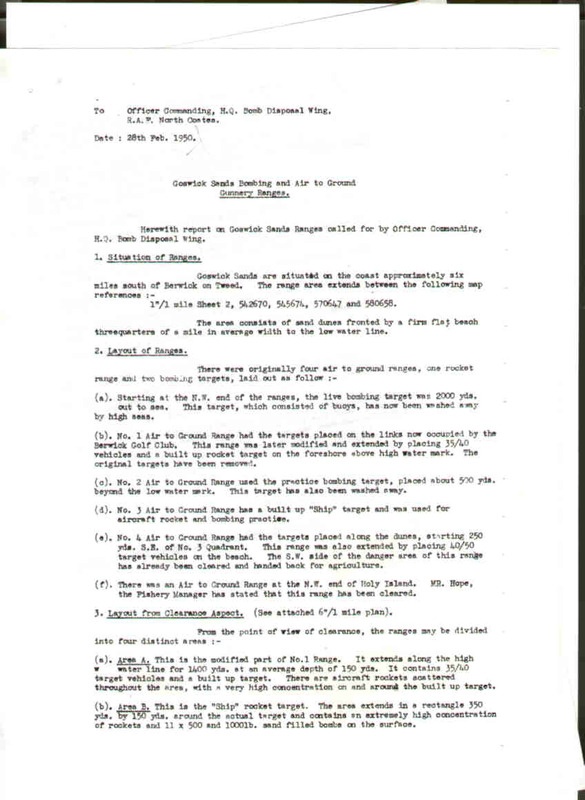 Included here are extracts from the U.S. Army Air Force reports of the fatal collision on 12 April 44 between a Spitfire of 57 O.T.U. Eshott and a P47 Thunderbolt attached to the Fighter Leaders School Royal Air Force Milfield. A flight of four P47 aircraft were involved in a simulated straffing attack on a motor convoy South of Milfield, Maj Fraser`s private army one would suspect, and during the recovery from an attack on the convoy Lt A.L.Serapiglia in P47D No 42-25530 at approximately 800 feet, collided with Spitfire Mk 1 R6762 which was preparing to land at Royal Air Force Eshott the pilot Sgt Kai Arther Knajenhjelm 2322. aged 19, a Norwegian, was killed, as was Lt Serapiglia of the 366th Squadron of the 358th Group of the 9th Air Force. this pilots total flying time in command was 654 hours 45 minutes and he had flown 91.10 in the previous three months.The president of the crash investigation board reached a verdict that each pilot was equally responsible for the accident and that to avoid repetition of the accident circumstances, that in the future similar excercises should be staged outside of "local flying areas" of nearby airfields from which regular flying is conducted. 1st Lt John E Hayden, who was No 2 to Col Glen E Duncan, leader of the flight, stated that the flight had been making 45 degree crossover attacks, back and forth across the convoy, bombing at the head of the convoy and working towards the rear, the convoy was running approximately North to South between Felton and Morpeth. "My position was on the West side of the convoy at the time, heading East when I observed two P47`s on the East side of the convoy heading about ENE in a turn to the left. The number two man, Lt Serapiglia, was about 200 feet behind his element leader. His altitude was between 200 and 300feet. A Spitfire suddenly appeared heading from East to West. Lt Serapiglias aircraft collided head on with the Spitfire. The Spitfire went into a flet inverted spin to the ground without burning. The P47 lost a wing in the crash and upon impact with the Spitfire burst into flames and tumbled to the ground. The accident occurred at 11.45 about a mile and a half South of Eshott field". Col Glen E Duncan, was credited with 19 enemy aircraft shot down, while flying the P47D Thunderbolt. "Dove of Peace", With the 366th Squadron of the 358th Wing of the 9th Air Force during his active service in Europe, before being shot down by German flak. I am unable to give the date of his death, at this time. I am indebted to Pete Shepperd, who I instructed with some years ago, and who, during his Royal Air Force career was a Pilot Attack Instructor, with 33 & 45 Squadrons, flying the de Havilland Hornet Mk 111 from Butterworth in Malaya in the 1950`s, he kindly gave me an insight into the basics of air to ground shooting and rocket projectile firing which I include here. 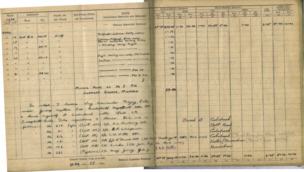 The short abbreviation above is how the firing of rocket projectiles and air to ground firing of the aircraft`s guns will appear in the ground attack pilots log book, especially when it is to denote a practice or training sortie on a firing range. Before undertaking these sorties, the pilot needs to understand some basics physics and be able to fly his aircraft safely and accurately close to it, and pointing at, the ground while looking only through the gunsight. This takes ability, confidence and practice. To hit a target with a missile of the non-aerodynamic kind such as a stone, arrow bomb, bullet or wingless rocket the launcher of that missile has to make an allowance for gravity. The allowance required depends on the time of flight from launch to impact. The time of flight is dependant on the initial launch speed and the acceleration or deceleration of the missile during its flight. For instance, a stone released from the top of a 16ft tower, in still air, will hit the ground in one second. Likewise, a bullet fired from a gun horizontally from the top of the same tower will decelerate during flight but still hit the ground after one second. A rocket, fired horizontally from the same tower, will accelerate during flight but will still hit the ground after one second. This decent know as gravity drop, is always vertical to the center of the Earth and is calculated using the gravity created acceleration, g, which is 32feet/sec2; so a missile with a zero vertical movement at launch will have a vertical component of 32ft/sec after one second of flight and have dropped 16ft. i.e. it will take 16ft to accelerate downwards from 0ft/sec to 32ft/sec. As g is a constant for all practical purposes when firing bullets or rockets from an aircraft at low level, then the gravity drop for any given time of flight of these missiles can be calculated and allowed for in the sighting mechanism. So we know the gravity drop for the time of flight of the missile. How do we know the time of flight ? Simple, calculate the mean speed between launch and impact and measure the distance between launch and impact (the range). Using time= dist/speed gives the time of flight. Now, your average fighter pilot cannot be expected to work out this for each different attack, so the answer is to fire the gun or rocket at a predetermined range. The pilot points the aircraft towards the ground target aiming with the gunsight which is set to allow for the correct gravity drop at the given range. 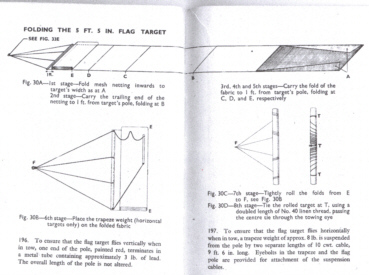 This judgement of range is learned by instruction and practice using the early reflector sight but later gyro gunsights (G.G.S) allow for the decreasing range as the aircraft dives towards the target. The ordinary reflector gunsight has an angled, semi-silvered glass onto which the sighting graticule is projected. The gunsight is directly in front of the pilots eyes and the image is directed back towards him. From his perspective he sees the sight graticule projected ahead of the aircraft as an illuminated fixed ring and bead. When aimed at the target it appears to be on that target with no depth of field focusing problems that are inherent with fixed mechanical sights. A range adjustment is built into the sight allowing the sighting line to be adjusted for differing ranges and for gun or rocket firing. A typical training flight for an R/P and A/G sortie would normally be carried out with sufficient ammunition for about four passes at air to ground on a fixed target and for R/P fired singly. A range safety officer controlled proceedings from a nearby range observation tower giving clearance to fire live and to caution pilots recovering below safety height etc. For A/G attacks, the pilot positions his aircraft at right angles to the line of attack and at the correct height and distance out to give about a 30 degree angle of dive. 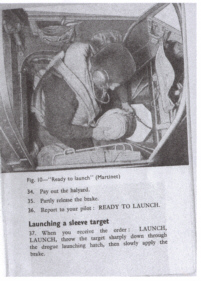 He turns in, sets the safety switch to fire, dives towards the target, flies the aircraft down the dive, controlling the aircraft so that the bead of the ring sight is on the target, fires a short burst at the correct range, recovers from the dive, returns to SAFE and goes round for the next attack. For firing R/P, the same dive angle is used but as the safety height is higher and the sighting requirements take longer and are more difficult, it is necessary to position higher and further out. With a significantly greater allowance for the gravity drop, due to the longer time of flight of the rocket over the bullet, the sighing line for R/P is very depressed. If the sighting point moves off to the left of the target, for instance, during the dive, a correcting roll to the right, will mean that the aiming point will initially move even further to the left. As it recovers, anticipation is required otherwise it will end up to the right of the target on rolling level. Practice is required for this to become automatic. Having positioned the aircraft the pilot turns towards the target, selects R/P and commences his dive; as the sighting point comes round towards the target, correcting the roll out so that it ends up on the target and not way past it .once again, the aircraft is flown by reference to the aiming point and the target, the R/P is fired at the estimated correct range and recovery from the dive is made above the safety height. When using the G.G.S. the estimation of the firing range becomes less critical. An aircraft following a depressed line of flight will perform an ever steepening curved path know as a bunt. This bunting effects the gyro in the gunsight and is used to reduce the gravity drop allowance of the aiming point as the range shortens. This allows for a greater latitude in the range estimation by the pilot. For operational use, R/Ps can be fired singly, in pairs, ripple( a fast sequence of R/P one after the other) or salvo ( all at once) and a 60lb semi-armour piercing explosive head is used. For training, a 60lb concrete head is used and an average error of under ten yards would be considered satisfactory. From the pilot`s viewpoint, R/P and A/G are very satisfactory excercises and skills to learn. With A/G the bullets strikes ( or misses) can be seen and the juddering of the cannons felt and heared. With R/P, the missiles leave with a thump and whoosh but only the initial part of their flight can be observed before recovery from the dive becomes necessary to clear the safety height. The range safety officer tells you the result - good or bad. NOTE. These notes are written with referance to the period from the 2nd W.W. to the 1960`s. R/P firing before the advent of the reflector sight must have been very difficult. 33 & 45 Sqd badges. 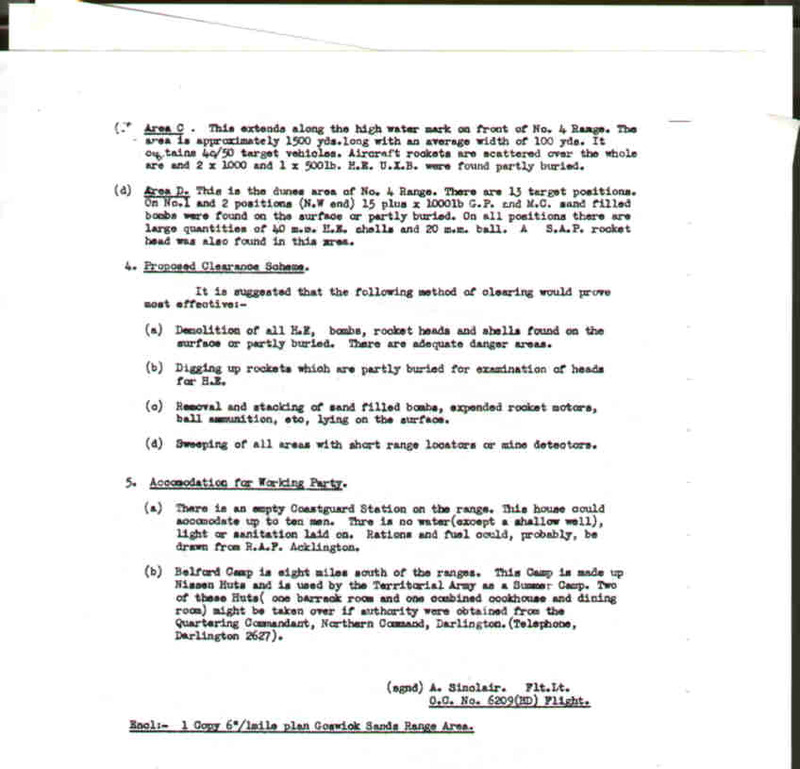 As the booklet say`s on page 18, the range was already well established at the time of the Fighter Leaders School, the early range is shown in the copy of the range chart used by the Royal Air Force Bomb Disposal team in 1950, this early team was very small in number and intent, being mainly concerned with the items of ordnance that were still to be found on the surface of the sand, and from time to time, those additional items lifted by the tidal action, the current team, although not much larger than the 1950`s team is well into a fifteen year programme of greater sophistication, and was well covered in the local Tyne Tees Television Programme " Magnetic North " in 1998. The booklet also gave an idea of just how much debris, some, would be, lethal debris, was laid down there by the various aircraft on a variety of courses. From its very beginning The range progressively underwent change, but the original range was at area "D", on the copied range chart shown above. Of special mention is the ship Target at area "B" on the copied chart, this target was made up of rough timber and complete tree trunks and in the form of a large vessels profile, and was principally used for rocket projectile attacks, there was also a rail cutting where now, 2003, two large sand dunes are in evidence. 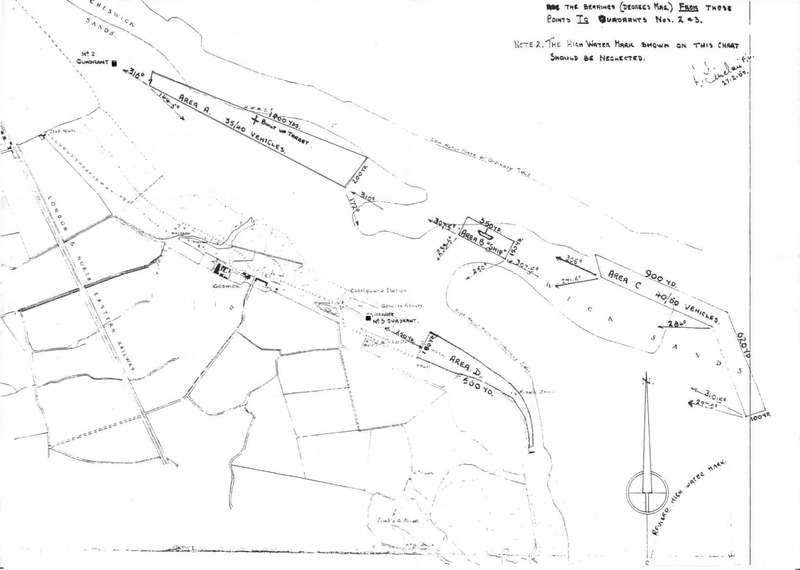 Some of the rumored happenings on or near by the ranges were that, sea trout and salmon were often retrieved by range personnel, after some bombing exercises and may even have been conveyed to the officers Mess kitchens later, another, that the armament section at Milfield had designed a rocket projectile rig and fitted it to one of Major Frasers tanks and operated in trials at Goswick, it is said it did not find support from the Generals who observed the later trials, but as some will remember a Sherman tank model, the Calliope, was evident from D-Day on, with a basic rocket rig, and in substantial numbers, in-accurate, but for scare value, very effective. I do know from boyhood experience, that the M.G. car company, in Abingdon, produced another weird design, the flail tank, for disposing the mines laid on the Normandy beaches, that also was based on a Sherman tank. The F.L.S. Officer Commanding. Armament Wing. Wg Cdr R.E.P.Brooker. D.F.C. Richard Edgar Peter Brooker. Born Chessington. Surrey. 1918. joined the Royal Air Force on a direct commission in April 1937. on the 17 July 37 he was posted to 9 F.T.S. Hullavington. Wiltshire. and on the 19 Feb 1938 was Posted to 56 Sqd Royal Air Force North Weald. Essex. Promoted to Pilot Officer 05 April 38. Promoted to Flying Officer 05 January 40. He claimed a Ju 87 destroyed on the 13 July 40 and a Do 17 on the 21 August 40, in this engagement he was hit by return fire and was slightly injured in the forced landing at Flowton Brook. Bramford. Suffolk. His Hurricane P3153 was burned out. Late summer 1940.Posted to Central Gunnery School. Sutton Bridge as an instructor. Promoted to Fl Lt 05 January 41 April 1941. Posted to command No 1 Sqd. Royal Air Force Kenley.Surrey. 10 May 41. He shot down an He 111, at night, also attacking three more bombers on the same sortie. Awarded D.F.C. 30 May 41. 03 Nov 41. Posted to the Far East.Kallang.13 Dec 41. He took command of 232 Sqd. after the C.O. was killed on 20 January 42 at Royal Air Force Seletar Singapore. On 01 February 42 the squadron withdrew to Palembang. Sumatra. 25 Feb 42. 232 Sqd evacuated to Java, the remnants of 242 Squadron were absorbed into 232 squadron at Tajililitan. Java. Promoted to Sqd Ldr 01 March 42. 05 March 42 some 7,000 Royal Air Force personnel moved from Poerwokerta to the port of Tajilitjap. South Java for ship transit to Adelaide. Where they arrived on the 15 March 42. After the last Hurricane was destroyed on Java, S/L Brooker and a number of pilots flew in a Lodestar to Australia. 27 March 42. He was awarded the bar to his D.F.C. Personnel Management Agency.Royal Air Force Innsworth. Gloucestershire. Confirm that as of 01.04.42 Sqd Ldr R.E.P.Brooker. Special Duties List - to command 77 Squadron Australia on loan to Royal Australian Air Force. New Zealand Defence Force Personnel Archives show 18.06.42 disembarked New Zealand. Posted to Masterton. Air Headquarters.And 19.06.42.- Special Duties List - flying on loan to Royal New Zealand Air Force. 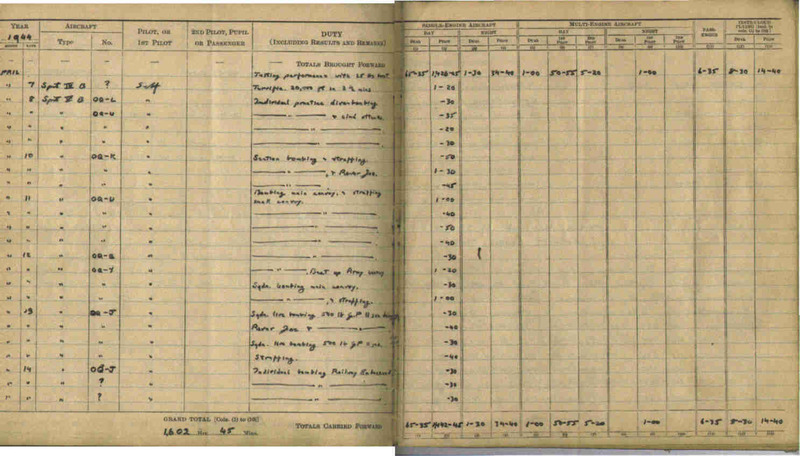 And 18.06.42.- Special Duties List - flying on loan to Royal New Zealand Air Force. where he is reported as Officer Commanding. 14 Squadron Royal New Zealand Air Force. July 1942-Feb 1943. Officer Commanding. 14 Squadron. Royal New Zealand Air Force. Masterton. New Zealand. flying Kittyhawks He formed this squadron from the survivors of 488 Sqd Royal New Zealand Air Force, who also fought on Singapore, Sumatra and Java, and who had flown Buffaloes and then Hurricanes.15 Feb 43 posted to Whenuapai. Air Headquarters. On his return to the U.K.10 April 1943 and with seven and a half enemy aircraft shot down, he was posted to command No 1. S.L.A.I.S. 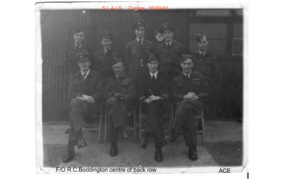 at Milfield, as Wing Commander Flying, posted across the airfield as temporary Officer Commanding 59 O.T.U. Milfield, then joining F.L.S. as a Staff Instructor, O.C. Armament Wing. May 44 posted Wing Leader 123 Wing. 83 Group. 2nd Tactical Air Force. Royal Air Force. Thorney Island. Hampshire. (198 and 609 Squadrons) and led the wings Typhoons through the D-Day landings. 01 December 44. Awarded the D.S.O. posted Wing Leader 122 Wing. 83 Group. 2nd T.A.F. At Volkel. (B80) Holland. while at S.L.A.I.S. he met Sqd Ldr John Wray, who was attending as a course member, their paths were to cross again later and the Milfield connection came into play again when John Wray became Wing Commander Flying of 56 O.T.U. Having relieved Wg Cdr John Wray at Volkel.Holland as Wing Leader of 122 Wing. 2nd T.A.F .his wing was comprised of five Squadrons, No`s 3, 56, 80, 274 and 486. In the six months from the Normandy landings, 06 June 44. The wing lost 123 pilots and in the first month of 1945 they lost 47 pilots. It was from Hopsten (B112) that Wg Cdr Brooker took off, leading a section of Tempests of 80 Squadron, on the 16th of April 45 to patrol the Hanover - Osnabruck sector with the attack priority, rail traffic, after attacking a train near Neuruppen, and while the section were re-forming his No 2 advised him that there was smoke coming from his radiator, followed by flames seen in his cockpit, the Wg Cdr was seen, to be trying to open the canopy, before the aircraft turned over and plunged to the ground. His No2. Sgt W.F.Turner. was, at the same time, shot down by FW 190`s both aircraft crashing and burning close by the autobahn at Wittenberge. He was awarded his second D.S.O. (bar) sometime after this. Dated the day before his death. Wing Commander R.E.P. Brooker.D.S.O. and bar., D.F.C. and bar. is remembered on the Runnymede Memorial, Panel 264. Although the range at Goswick and the Air to Air, (A to A) ranges out to sea, the North tow, from the Holy Island to the Farne Islands and the South Tow, from the Farne Islands to Dunstanburgh Castle, existed from December 42, when S.L.A.I.S. 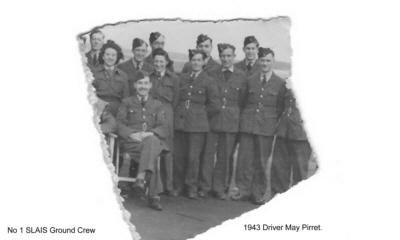 (Specialised Low Attack Instructors School) formed at Royal Air Force Milfield. Commanded by Wing Commander Denys Gillam. D.S.O., D.F.C and bar., A.F.C. with some six N.C.O`s and twenty airman. 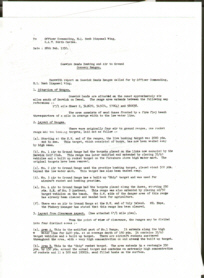 The Towed Target Flight of `X` Squadron, kept no Official Log Book of the day to day operations. But from 26 Jan 45 to 05 Oct 45, Flight Sergeant Allan Edwards, the Senior Non-Commissioned Officer, (S.N.C.O. ), instigated an un-official log book of Drogue operations and Hits on targets, some of the comments make humorous reading. I`ve pestered him with many questions over the years and he has usually come up with an answer, if not the written proof. Bearing in mind this period, January to October 45, saw the Royal Air Force going from an at WAR situation to the relative comfort of peace, in Europe, so that kind of diligence was beyond the call of duty. K. Riley. D. Booth. R. Palmer. S. Price. G. Miller. T. Laws. R. Jones. V. Warne. R. Lakeman. P. Brennan. L. Lineker. W. Heffernan. R. Elliot. 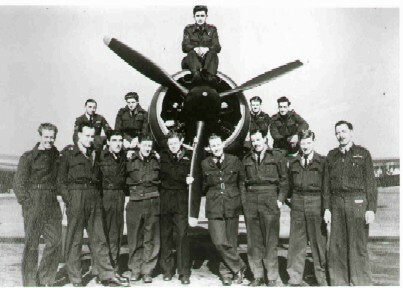 The towed target operators were unique, in that they were volunteer aircrew, well all aircrew were volunteer. but they had no award of an aircrew wing, (brevet), to indicate their airborne duty, but they did enjoy their few pence flying pay and aircrew rations. 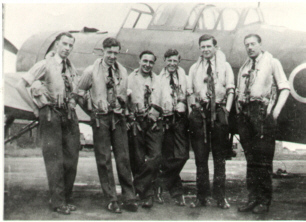 Some towed target operators had already completed one or more flying tours with other flying commands, such as Training Command, Bomber Command or Coastal Command and continued to wear the wing, of their aircrew duty, others were ground tradesmen who re-mustered as Towed Target Operators, (T.T.O`s), just for the hell of it. Allan Edwards had completed a tour with the Pathfinder Force of Bomber Command, as a Flight Engineer, marking targets for the main force of Bomber Command prior to going to 56 O.T.U. Milfield. Most of Milfields aircraft were parked out on the hard standings and not dispersed off the airfield, the hangars being used for maintenance work on the aircraft. The six Martinet towing aircraft being parked at the Target Towing Flight dispersal area, this is where the inspections of the aircraft and the associated make up of new target flags or sleeves, new cable lengths prepared and fitted to the winch drum and the other ancillary towing equipment inspections were carried out and the aircraft made ready for the next days flying programme. 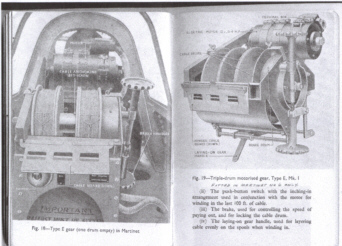 Martinets were fitted with wind driven winches, the Type B, Mk 11a or Mk 11 b, a single drum winch, or electric motor driven winches, either the Type E, a triple drum winch or the Type F a twin drum winch. 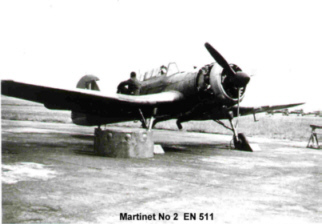 The Martinet aircraft listed above were fitted with the Type F, electric, twin drum winch, each drum carried 1,200 feet of seven strand 10 cwt cable, the last 100 feet of cable, between 100 feet and 90 feet was coloured RED, and between 20 feet and 10 feet was coloured YELLOW, to identify the approaching last 100 feet, the end of the cable terminated in a spliced loop, a swivel unit was fitted between the cable loop and the rope halyard, which had spliced loops at each ends and was of sufficient length to clear the aircrafts tail, the target was fitted to the halyard via a "weak link " loop made from 2 lb breaking strain cord. The T.T.O`s spent their non-flying time making up the equipment, splicing wire and rope, repairing targets, folding targets, retrieving targets returned to Milfield airfield after an air to air firing sortie and evaluating the hits upon the targets by the individual attacking pilots, reporting these findings to training wing administration office for inclusion in the individual pilots course reports. As you can see, the position of the T.T.O is lying down. As he would be, following take off and while the pilot was climbing to his range height, so the T.T.O. would see nothing, as he would be busy fitting a new target to the cable and preparing to throw it out of the aircraft. So if you don't ask the right questions you don't get the right answers! anyway, by now the aircraft would be approaching the range and the pilot would be ready for the target to be deployed. The T.T.O. By this time has attached the prepared flag target to the towing cable so he is now joined in his rear cockpit with a 5 feet 5 inch, weighted pole with a 20 feet long by 5 feet 5 inch wide target rolled around it, there can`t have been much spare space in there, on the command by the pilot " Stand by to launch", the T.T.O. 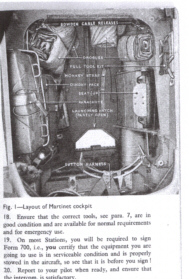 then pays out the halyard through the launching hatch into the airflow, releases the winch brake, followed by the pilots command, "Stand by, Stand by" these commands being repeated by the T.T.O. then the command "Launch, Launch", the T.T.O. 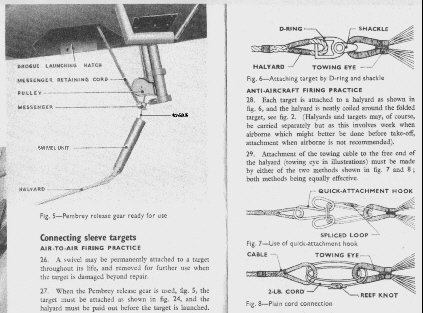 obey`s watches it open and applies the winch brake, he then visually inspects the cable and target and reports, " Target Streaming" pilot acknowledges "Target Streaming", pilot advises " Pay Out, Pay Out", and the T.T.O. 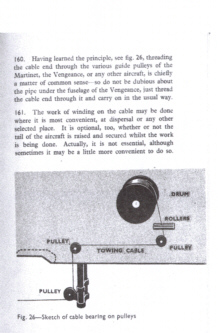 gives the advice " Paying Out" releases the winch brake and pays out the cable to the required length, and advises the pilot "Target Streaming In Full Tow", unless there is a problem with the target. Although both the towing aircraft and the attacking aircraft were fitted with the T.R. 1143 radio and its associated crystal frequency control unit, with its four selector buttons, the towing aircraft did not make radio contact with the attacking aircraft, both aircraft used the same frequency listening out on button "A" 5840 Kcs , Milfield Local Control, call sign "Blotpad", or, if operating from Brunton, button "A" 6480 Kcs, any signals from one aircraft to the other were restricted to visual signals of advice while on the shoot i.e. Button D.	 6310 Kcs	 Sector Control Frequency Fixing, Homing and "MAYDAY"
Button A. 6480 Kcs Local Air Traffic and Homing. Button B. 6020 Kcs	 The same as in "X" Sqd a/c. The Air to Air Range between the Holy Island and the Farne Islands, (North Tow) and the Farne Islands and Dunstanburgh Castle, (South Tow ). The mean line of the towed target was parallel to the coastline and at one mile, distance. And at an altitude of 2,000 - 6,000 feet and clear of cloud. 243 mph, but I believe the Martinet towed the flag target at 210 mph. So with the tug now flying the tow line, at an altitude between two and six thousand feet, clear of cloud and on a line approximately one mile "East" of the mean shore line its just a matter of awaiting the first briefed customer who will fly his number of passes on the towed target using live ammunition and camera gun until the detail is completed, the tug will continue to fly the tow line until the next aircraft joins and is given the signal to commence his shoot. This continues with successive aircraft, until either the tug leaves the tow line, or the target is so damaged, or shot off in some cases, that a new target is fitted and the tug rejoins the tow line or the tug returns to base. In the event that the detail is completed, usually three aircraft, who`s ammunition could be coloured Red, Blue, Black or left Plain. 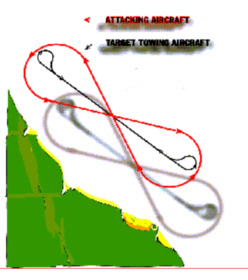 If the tug aircraft is returning, with exercise completed, the pilot will join the circuit at normal circuit height, but make his final approach to the dead side of the circuit and at 200 feet above airfield level, with the intension of dropping the target and 1,200 feet of cable in the designated dropping zone. The pilot and T.T.O, then go through the command and response procedure: pilot, "Stand By To Drop",.T.T.O " Standing By To Drop" the T.T.O. is observing the drop zone and would advise the pilot of any hazard on the drop zone. 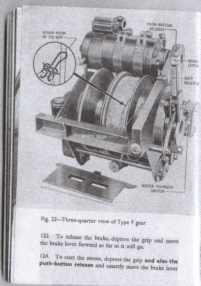 Pilot, "DROP, DROP, DROP" And the T.T.O immediately releases the winch brake and allows the cable to run off the winch drum and then reports, "Cable and Target Dropped", Roy said from this point they could indulge in some legitimate low flying when going round again to join for a circuit to land, while they were going around, followed by the landing, two ground borne members of the T.T. Flight, alerted by air traffic control, were folding up and recovering the cable and then returning to the section, sometimes, before the dropping aircraft had landed and taxied back to the T.T. Flight dispersal. In the event of the target snagging on the aircraft, the pilot would have been advised by the T.T.O. as to the nature of the foul up, and would contact Local Air Traffic Control and on his return to the Milfield circuit would see the Crash fire and rescue vehicle, and an Ambulance awaiting his landing, these mishaps were not infrequent, nor were the occasions when a target was pitched through the launch hatch without it being attached to the cable, know as finger trouble - failure to extract the digit, a source of amusement for the innocent and embarrassment for the T.T.O. to blame. I`ve used the title Air Traffic Control, more for clarity, at this time, in fact in the 1940`s the Control Tower was know as the Watch Office, the " flying prevention branch " had not yet been invented. A/c No Take off Land Total Time. Tow	 Target No Results Runway in use T.T.O. Total Successful Landing by No 2 acrft, W/O Lakeman/Laws, Fire tender and ambulance in attendance. 4 Hours flown 08.50. 20.00 hrs Finished work for the day. I hope you can imagine from this, the hordes of bicycles, leaving all parts of the airfield and maintenance sites, together with those on foot and converging together on main site or their dispersed billets. The photograph below gives some idea of the distance between such points. 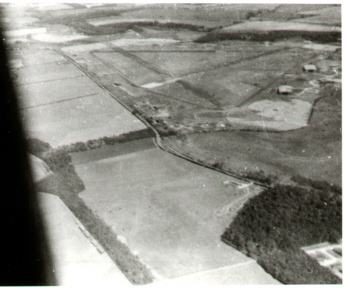 Len Linekers photograph of the airfield from the rear of the Martinet 05 July 45. L.A.C. Follet. 1479235 26.01.45. 10.02.45. A.C. Brennan 1904160 15.03.45. 20.09.45. The Original Six Ken McDonnell. Vic Warne. Ken Follet. Ginger Heffernan. Allan Edwards. Len Lineker. H. Marshall. R. Brennan. L. Lindsey. R. Ford. Fowler. 28.01.45. Large percentage of station personnel clearing runways, T.T.O`s & Pilots not included. 29.01.45. More clearing of runways, more snow falling, T.T.O`s & Pilots still scrounging. 05.02.45. Cable dropped on H.T. 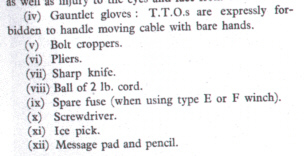 cables "N.E" of airdrome, as result of aircraft too low on approach. 04.03.45. 09.40 Weather u/s No 2 returns after take off, No 5 returns from taxitrack. 10.30 LOST Typhoon pancakes after six attempts. Weather extremely poor. Hills invisible. 12.03.45. Allan takes the record ! F/Sgt Weaver, Pilot, comes in too high. Flag drifts, narrowly missed the Tower. 12.03.46. 13.25 Pancaked, trip included rolls etc. becoming an Elliot specialty. (Martinets not stressed for aerobatics). 28.03.45. 14.00 All bods go down in the transport to collect the 60 flag targets from workshops, which have been lying there for the past six weeks. 17.00 200 - 4 foot SLEEVE targets from 14 M.U. Carlisle. These, believed to be no good for towing. F/Sgt Riley in aircraft No 2 while taxying on "North" perimeter before take off and doing a radio check, taxies into petrol bowser. Damage to acrft resulted in a bent prop, port wing holed, and several dents in engine cowling. Kens punishment from the C.F.I. (Chief Flying Instructor) is 7 days confined to camp. Which obviated further inquiry. Len Lineker. T.T.O & Ken Riley. PILOT. 01.04.45. Raining all day, No flying. Received 240 fathoms of signal halyard - more splicing ! 02.04.45. Sgt Ford in acrft No 4 with Riley as pilot, practice streams. Cable wrongly routed, cuts floor of trough rather deeply. 06.04.45. Ginger fainted while airborne. 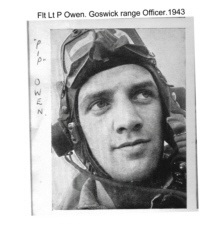 Pilot F/Sgt Laws, flag dropped in woods "East" of aerodrome. Recovered. 19.04.45. Ginger flown down to Eshott in the Domine, most of us fly down with him, to see him join the Army. 21.04.45. Special Note ! Ginger returns ? failed the medical. 26.04. 45. Tempest Mk 5 EJ560 overshoots Rnwy 24, ploughs through the hedges over road and into field, turns two somersaults, engine breaks away from fuselage and tail breaks off at a point some four feet aft of cockpit. Finishes by standing on its nose. Pilot escapes unaided and unhurt, F/Sgt A.E.Gunn a 56 O.T.U. Instructor, was returning short of fuel, on overshoot, undercarriage failed to retract. A.E.Gunn stayed in the Royal Air Force after the war and in 1948 attended the Empire Test Pilots School at Royal Air Force Farnborough. Later he became Chief Test Pilot for Boulton & Paul Aircraft Company, doing all the development flying of the P111 and the P120 delta aircraft, including a successful ejection from the P120 on 29 August 52 when flying from Boscombe Down. Wiltshire. 03.05.45. First flag dropped "drifts" onto runway in use. Smart work by Allan and Mac clears runway. 04.05.45 Early turn for Ginger, this is the first early turn for some time, he has been very busy, playing table tennis, billards. A very strenuous game!. 07.05.45	 V E Day is supposed to be tomorrow. 08.05.45. Today is the end of the war in Europe, we get a half day today and tomorrow off, bags of beer. 10.05.45 Back at work today, working hard, 10.30 Jack Laws airborne, first flag dropped O.K. second flag, owing to finger trouble, dropped, drifted and landed somewhere near the Y.M.C.A. he said," that it came off in his hand". 13.05.45. Disorganisation and discontent in the section. 31.08.45. At 13.05. Tempest EJ808. F/O A.B.Mattock. No 6 course. 56 O.T.U. undershoots Rnwy 36 by about 50 yards, undercarriage collapses, aircraft carries on about 50 yards up the runway, engine breaks away from fuselage. Fuselage only catches fire. Pilot escapes unhurt. 01.10.45. Jet kite performing over aerodrome. 03.10.45. C.O`s parade, at which the flight was conspicuous by its complete absence. An ideal model of F. L. S. Milfield training put into practice, was within the week following the Normandy landings - 6th JUNE 1944 - first advanced landing ground ready on the evening of the 7th June. Typhoons took off to attack German armour 1,000 yds forward of the airstrip, turned out to sea, climbed to 8,000 feet, turned, dived for rocket attack, pulled up, 180 degree turn, onto approach to land, full stop. Group Captain Denys Gillam commanded a Typhoon wing, No 146, which comprised No's 193, 197. 257. 263 & 266 Squadrons, in 2nd T.A.F. a fitting continuation of his earlier work setting up S.L.A.I.S. at Milfield. Then later while leading No 146 Wing to attack a building in the old Dutch town of Dordrect, which the leaders of the Dutch resistance said was the venue for a staff conference of the German Fifteenth Army, Gp Capt Gillam dived from 6000 feet to ground level, dropped his marker bomb, then his two 500lb bombs and called in the attack, which resulted in two German Generals, seventeen Staff Officers, fifty five other lower ranks and twenty Junior ranks being killed. While never serving at Milfield, the greatest champion of the Typhoon, Sqd Ldr Roland Beamont, C.B.E., D.S.O. & bar, D.F.C. & bar, DL. FRAeS., has written as foreword to his own, and other books - "The Typhoon pilots Qf the 2nd Tactical Air Force played a major part in the Battle for Europe". Late in 1942 he was told to attend a meeting called by the Commander-in-Chief at Fighter Command Headquarters. He was astonished to find the whole future of the Typhoon was at stake. Despite being the most junior officer attending the meeting, but knowing the Typhoon from months testing the aircraft as they were produced at the Hawker's factory, and then as a squadron leader of a Typhoon squadron involved, at his own request in night intruder operations into occupied France, in addition to his squadrons planned day fighter operations, he argued the aircraft's superior qualities. He was a champion of the aircraft then, a champion of the pilots as a Typhoon Squadron Leader, and Tempest Wing Leader during the invasion and in support of the advance through Europe, until shot down by ground fire, doing the thing he had briefed others not to do in ground attack, making a second and a third pass at the target. German Chief-of-Staff, General Speidel said after the war - "Armoured operations were completely wrecked exclusively by 2nd TAF supported by a highly trained ground wireless organisation". In all twelve Air Support courses were run by the Fighter Leader School at Milfield and, I think, having had the opportunity to read the Station Operational Record Book at the Public Records Office and Mr E. L. McLintic's copy I'm sure that each successive course was improved and benefited from the up-date of tactics and the extensive use of film taken, both at Milfield, and after the landings, of actual combat film. One of the busiest units on the station was the film processing section! 6 Pilots were killed as a result of aircraft accidents and I Pilot was injured in an undershooting incident during the period of the Fighter Leaders School operations.